Bespoke surface design for shirt brand Godâ Skjorter - Inspired by the landmarks of Bornholm island. Delicately detailed vector illustrations of flowers and butterflies used in the branding for new Australian cosmetic line, Eden & Farrow. These botanical illustrations were used on their website, as well as on the packaging for the natural products. Working to Lola's Apothecary's passion for all things nature inspired, I was asked to create a rose and lavender surface pattern as packaging for their soy candle range. The design was printed in white onto black frosted glass, as well as being used for all business stationery. 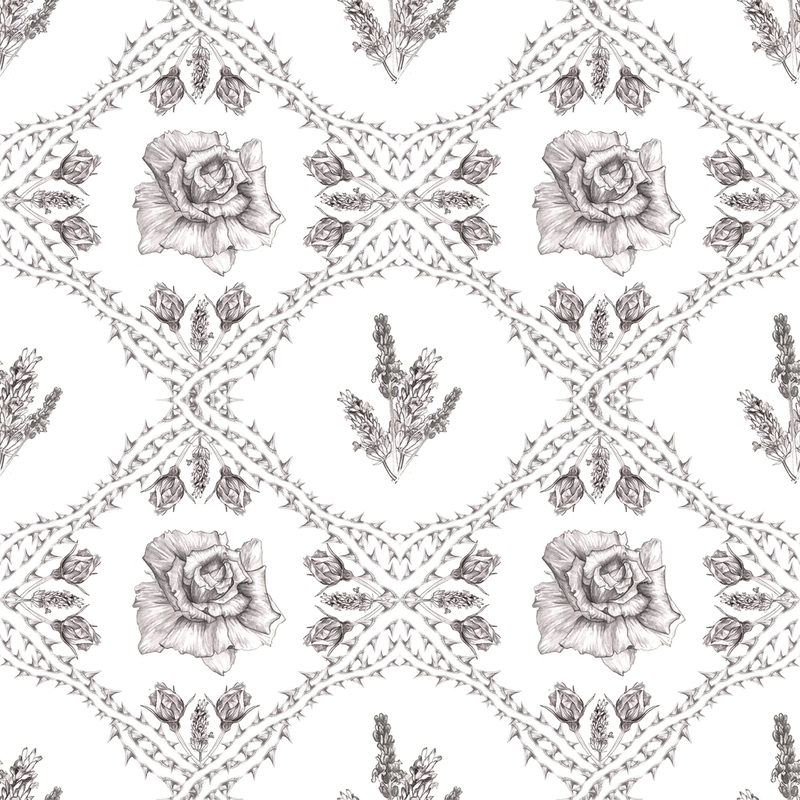 Working to Lola's Apothecary's passion for all things nature inspired, I was asked to create a rose surface pattern as packaging for their soy candle range. The design was printed in white onto black frosted glass, as well as being used for all business stationery. In 2014 I was awarded the opportunity to design an exclusive home ware line for Asda's George Home in conjunction with the Princes Trust. Working under the theme of 'Palm Springs' I created a tropical collection that was released nationwide and online with 10% of all proceedings going to the Princes Trust. My Cockatoo print bedding also came with small throw cushions and quilted blanket, all designed from my Nottingham studio. Here is a close-up of the Cockatoo print I designed for Asda's George Home in conjunction with the Princes Trust. Entirely illustrated in fine mechanical pencil, I then digitally coloured the line work to create this fresh and exotic design. As well as designing bedding and blankets, the Palm Springs range also extended to the living room. 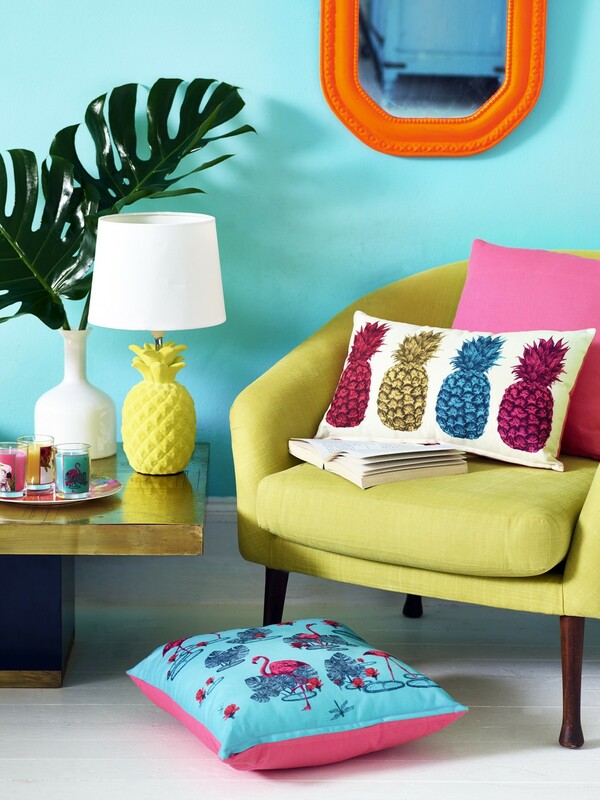 Illustrations of pineapples and flamingoes were lovingly printed onto cushions and candles, as well as being brought to life in 3D form, such as the yellow pineapple lamp featured. A close-up of my flamingo and lily pad print with featured on cushions and cool bags for the Palm Springs range. 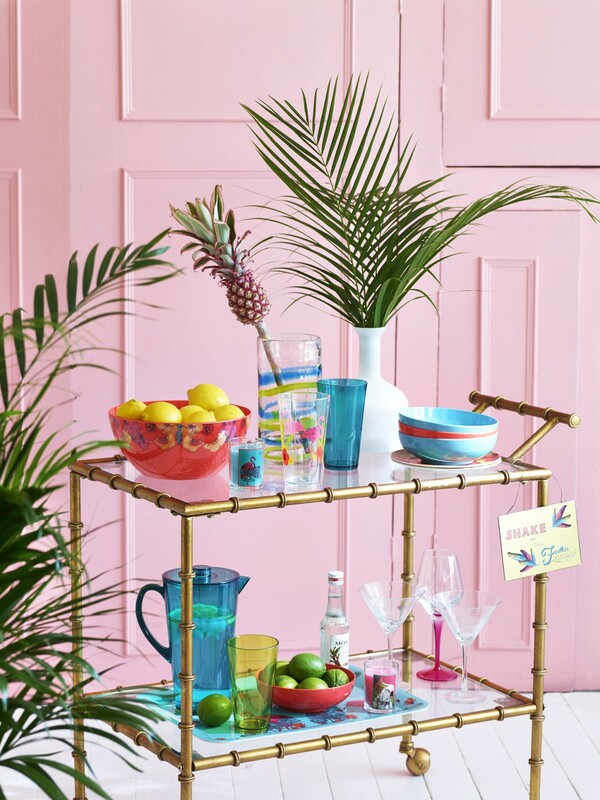 Working to a tight colour scheme, I created designs to be applied to picnic and table wear. Statement prices like the turquoise bird cage were also introduced to compliment my highly detailed illustrative prints. Close up of my coloured pineapple print which featured on cushions and candles. Inspired by 1950's americana, I created illustrations of exotic hibiscus flowers to be used on melamine picnic wear, perfect for outdoor use or summer parties. Close of one of the metal hanging signs created in the Palm Springs collection. Each sign featured my own hand-rendered typography, all inspired by 1950's font and motel signs. Peru inspired print, featuring a mix of pencil and watercolour elements to make a bright and fresh summer print. Bespoke pattern created for application on Gerald the flat pack dog, as designed by Lazerian. Inspired by lace, I wanted to create something gentle and delicate to contrast against the structured frame of Gerald's make-up as well as a design to represent Nottingham. The limited edition Gerald's were featured at New York design week and London Design Festival. A pre-built Gerald featuring my lace-inspired design. 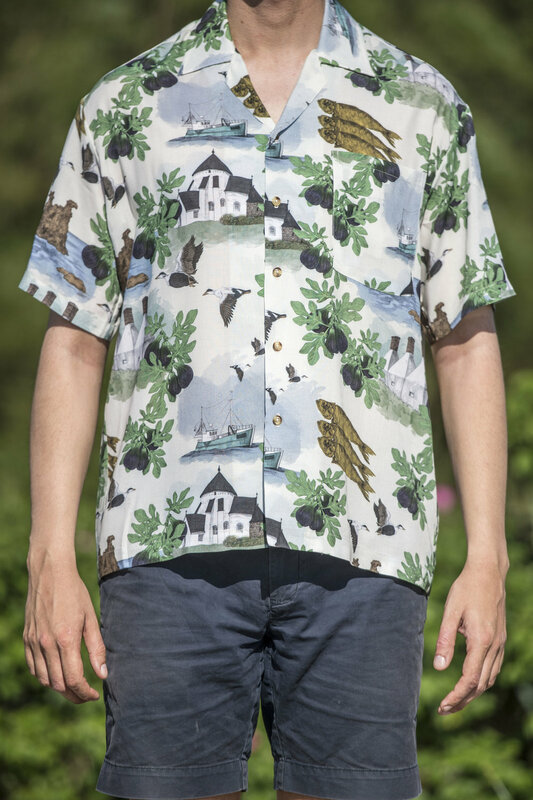 Toile de joue inspired pattern featuring key elements of Champagne's history including Louis XIV, World War 1 and the traditional methods of tilling the land. All elements have been created using fine mechanical pencil before being digitally collaged to create a seamless repeat pattern. This design has been commissioned by upcoming Champagne company De La Terre for use on their website and promotional material. My first ever repeat pattern, inspired by the beauty of the British countryside. Features pencil drawn stags, bunnies and blackbirds surrounded by blackberry wreaths and roses. This piece is a self-initiated design and is included in my own personal design collection. This print features in my own Etsy shop, applied to greetings cards, purses, t-shirts and gift wrap. Part of my own personal design collection. Seamless repeat of crystal shards, created in fine mechanical pencil and graphite before being digitally coloured and tiled. This print features in my Etsy shop, applied to greetings cards, purses and t-shirts. A best seller in my sublimation t-shirt range which was successfully funded through Kickstarter in 2015. Summery print inspired by coral reefs, tropical fish and sea turtles, illustrated in fine mechanical pencil and digitally coloured and collaged in Photoshop. This bright print features in my Etsy shop, applied to cosmetic bags and purses. This tropical print featured mainly on my cosmetic bag range which I handmade in my Nottingham studio. After many requests from my Etsy customers to create patterns with darker backgrounds, I decided to create this black and white print to coincide with Halloween. Inspired by palmistry, the cosmos and all things mysterious I wanted to also make this print pay homage to the sun and moon prints that were largely worn in the 80's and 90's. This striking design features in my Etsy shop, applied to my sublimation t-shirts and purses. After many requests from my Etsy customers to create patterns with darker backgrounds, I decided to create this black and white print to coincide with Halloween. Inspired by palmistry, the cosmos and all things mysterious I wanted to make this print also pay homage to the sun and moon prints that were largely worn in the 80's and 90's. This striking design is most popular on my Kickstarter funded sublimation t-shirts. A custom request received through my Etsy shop to create a Red rose print that would be printed and made into a laptop sleeve. I created the design not only in red, but also in it's original grey pencil version, which the customer wanted to use on the back of the case. A bright Spring/Summer 2015 design featuring jungle animals surrounded by baroque style ferns and flowers. Look closely to find the snakes and parakeets! This tropical design features in my Etsy shop, applied to my sublimation t-shirts plus a limited edition line of handmade handbags. I predominately used this design printed onto linen cotton canvas, creating a limited edition range of saddle style handbags. I handmade each and every bag, including the piping, collapsible sides and inside pockets, in my Nottingham studio. Part of my original collection, I created this Indian inspired design after my British inspired print. Features elephants, tigers and roller birds as well as beautiful lilac lotus flowers. This design features in my Etsy shop, applied to greetings cards, writing sets, gift wrap and purses. My Tales of Two Tigers print was mainly used on my handmade iPad cases, which I made using complimenting features such as lilac zips, all sold through my Etsy shop. Part of my original collection, I created this Japanese inspired design after my British inspired print. Features cranes, frogs and swallows nestled between Japanese Chrysanthemums. This print worked well on many accessories, including my hardshell iPhone cases. Submission for the Spoonflower design contest, in conjunction with Sprout Patterns. I created this Japanese Garden inspired design using a Toile de Jouy framework and a traditional Japanese textile colour palette. Personal floral repeat pattern to be used in my own collection. A self initiated design, created to coincide with the Chinese New Year in 2015. I made this design a free downloadable wallpaper for laptops and mobile devices. A more macabre design that's become a firm favourite for medical students and radiologists. Submission for Lilla Roger's Make Art That Sells competition. The brief was to create a print that would be suitable for a specific client. A word of our choosing also had to be included in the design.